Home → Chemicals → Hillyard, Arsenal One, Q.T. 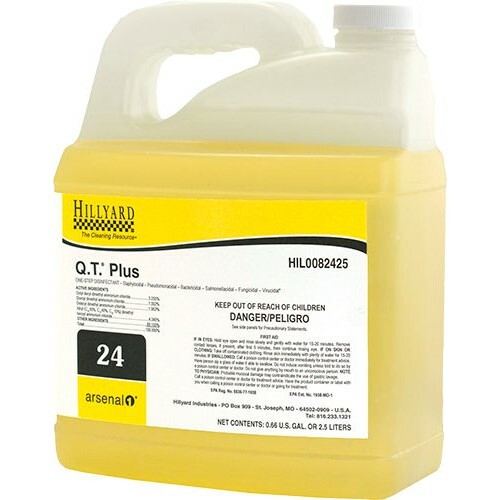 Plus #24, Dilution Control, HIL0082425, Four 2.5 liter bottles per case, sold as One 2.5 liter bottle. A hospital-grade disinfectant/detergent, cleaner, sanitizer, fungicide, mildewstat, virucide, deodorizer that cleans and controls the hazard of cross-contamination from environmental surfaces. Q.T. Plus is designed for use on walls, countertops, fixtures, restroom and shower rooms, and other hard surfaces where disinfecting is a must. Active Ingredients: Octyl decyl dimethyl ammonium chloride 3.255%, Dioctyl dimethyl ammonium chloride 1.302%, Didecyl dimethyl ammonium chloride 1.953%, Alkyl (C14 50%, C12 40%, C16 10%) dimethyl benzyl ammonium chloride 4.340%. Other Ingredients: 89.150%. Higher pH removes soils ordinary neutral disinfectants cannot. Mild lemon fragrance. EPA registered disinfectant. Dilution rate 1 oz per gallon. Higher pH removes soils ordinary neutral disinfectants cannot.